One-dish meals that take oven-time but not much else are a godsend. When these one-dish meals use the produce in the Winter CSA share for which I write recipes and are gobbled up by the husband and kid and snacked on at room temperature at 10pm by the husband walking by the stove. . . Well, that’s an extra good thing. And if you have roasted frozen tomatoes on hand from last fall’s harvest this is a great way to employ them. If you don’t you can use drained diced canned (preferably fire-roasted) tomatoes. I keep nice, smoky bacon (Nueske’s available at Pastaworks) in the freezer as well for dishes just like these so there is no need for last-minute runs to the store. And to make it vegetarian I would substitute a teaspoon or so of smoked paprika, Pimenton, for the bacon. 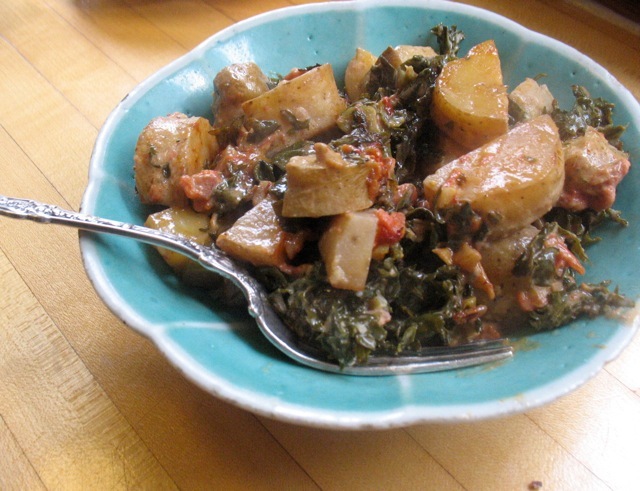 This dish was loosely inspired by friend and local author Diane Morgan’s delicious new book Roots though I employ a whole bunch of kale instead of 2 tablespoons parsley and a variety of other changes in this adaptation. And as with last week’s post in which I imagined the many possible variations of the Cauliflower Pasta “Risotto” (several of which I’ve tried with great success), this dish begs for adaptations. Any hearty green, leafy vegetable would be good. Sweet potatoes or parsnips or celery root or rutabaga could take the place of the spuds. You could use chicken stock or vegetable broth instead of the cream, and so and so forth in cook-with-what-you-have fashion. 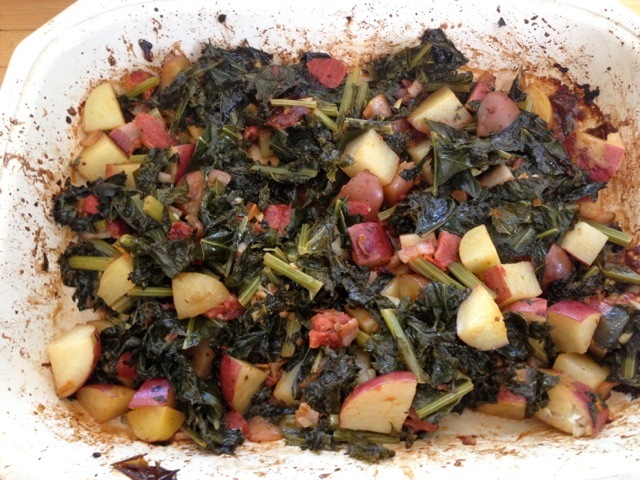 It is inspired by a recipe from Roots (by Diane Morgan) but is substantially different. It’s definitely a new favorite dish in our household. It takes a while to bake but otherwise it’s very quick to pull together. And please see my suggested variations above if you don’t have these exact ingredients on hand. 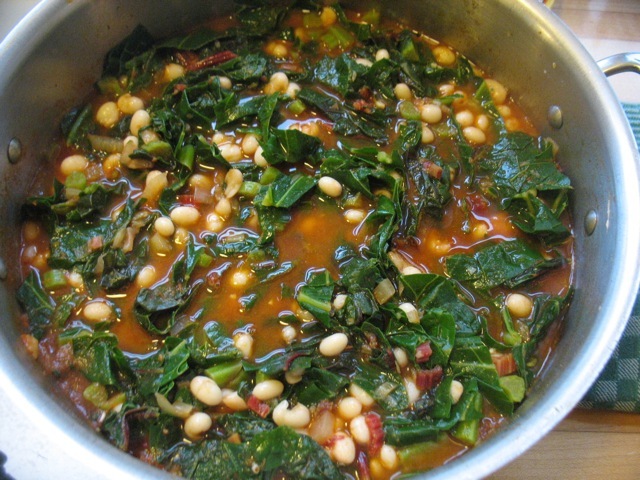 This makes quite a bit but it makes a great main dish and is excellent the next day so it’s seems worth making the whole amount but by all means reduce the quantities if you like. In a large bowl combine all the ingredients except the cream. Toss everything together well and transfer to a 8 x 13 or other large-ish baking dish. Pour the cream over everything. Cover the dish tightly with foil and bake for 30 minutes. 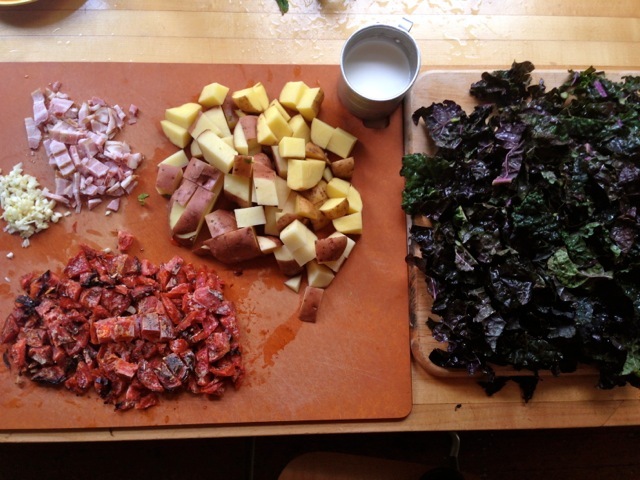 Remove from oven and stir everything well—this is important to get the kale mixed in well and re-coated with liquid since it may still be a bit chewy. Return to oven, covered and bake another 20 – 30 minutes. If there is quite a bit of liquid in the pan you can remove the foil and bake uncovered to reduce it a bit. When everything is tender remove from the oven and add the pepper and taste for salt. Serve immediately. My father always told me not to over promise or over sell or just not be so darn hyperbolic, but I just can’t help myself. My son and husband and I all ate two plates of this last night with such glee that I must write about it today and post poorly lit photos because that’s all I have and I don’t have time to remake the dish in day-light. And there are NO leftovers. The technique/recipe is inspired by a dish called Dressy Pasta Risotto from Dorie Greenspan’s wonderful book Around My French Table. My addition of a head of cauliflower and liberal grating of fresh nutmeg and the omission of much of the butter and all of the mascarpone has got me thinking about all sorts of other versions. I’m going to try Brussels sprouts and bacon maybe or kale and garlic or winter squash and sage. . . The possibilities are vast and exciting. I used tubetti pasta, a favorite shape I use in this chickpea dish and generally have on hand to add to soup–a surefire way to get my son to eat anything even if they’re just a few of them on the plate. 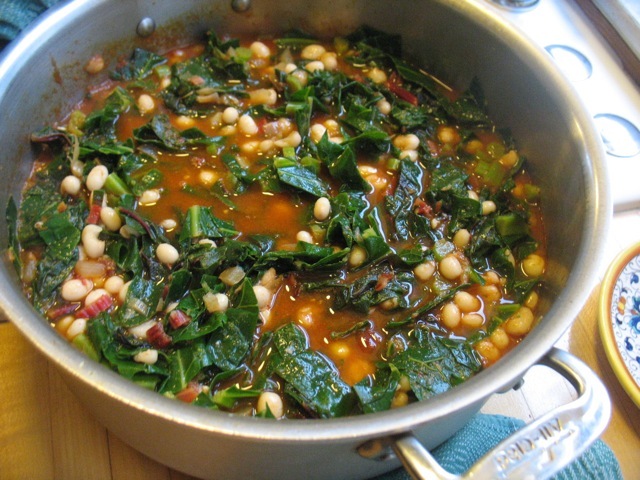 Serve this dish with a salad of arugula and/or chicories or other winter salad green to add some color and contrasting flavors to the plate. My idea of a perfect winter meal. As Dorie notes, “this is risotto” the way that finely sliced apples are carpaccio, which means not at all. . .” but the technique is just enough reminiscent of risotto that I appreciate the reference and continue to use it. 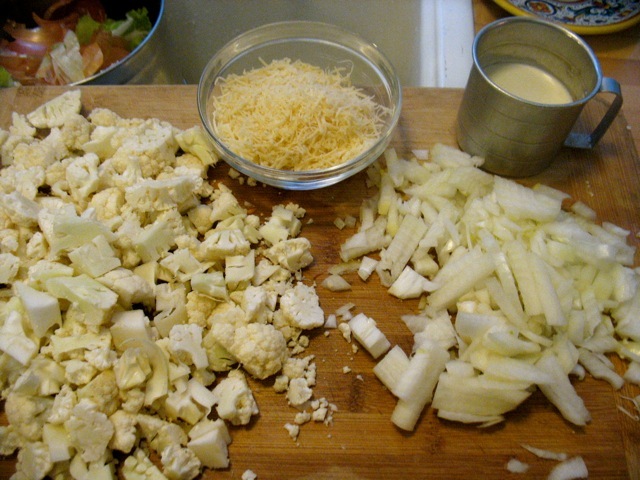 The fastest way to prepare the cauliflower is to slice the head into 1/2- 3/4-inch slabs, top to bottom, and then proceed to cube those. Some pieces will crumble off but that’s just fine. Use as much of the heart/stem as you can if it doesn’t seem to0 tough. Heat the olive oil, or oil and butter, in a large skillet over medium-high heat. Add the onion and a few pinches of salt and cook for 7 to 8 minutes until soft and turning golden, stirring often. You may need to reduce the heat a bit. Now add the broth or stock and bring to a boil. Add the pasta, stirring well and then simmer for about 10 minutes uncovered. Now add the cauliflower, stir well to incorporate and then cover and cook for another 7 or 8 minutes until the cauliflower is tender. At this point add the cream and a generous amount of freshly ground black pepper. Cook uncovered for about 3 minutes until it thickens slightly. 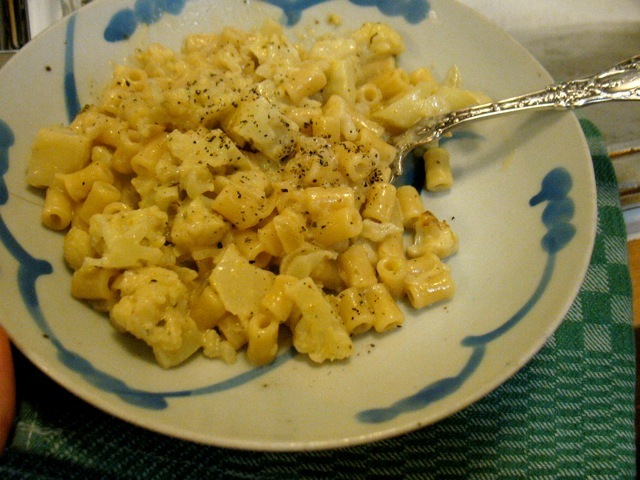 Stir in the parmesan and the nutmeg and adjust salt and pepper to taste. 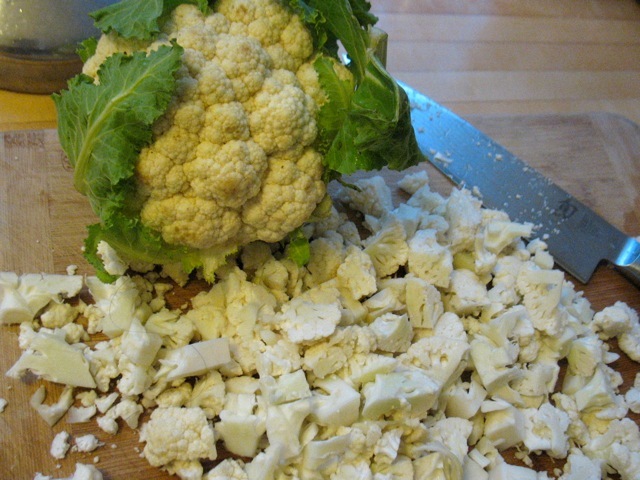 The cauliflower should be soft but not falling apart. It should not be al dente for this dish. Serve immediately.